New Jersey Career Center Consortium (NJC3) has been established in order to provide the highest level of programming for the state of New Jersey. Become a member by clicking here! New Jersey Career Center Consortium strives to be the model of academic-employer partnerships. Our focus is to continually increase the competency and professionalism of Career Centers, provide programs of clear value to colleges and employers and inspire the highest level of active participation from our career services and employer membership. In addition, NJC3 is committed to encouraging New Jersey colleges and universities to adopt the concept of Cooperative Education and Internships; to building partnerships among all New Jersey Cooperative Education colleges, universities and employers; and to providing support to strengthen new and existing Cooperative Education and Internship programs. Student of the Year Awards: Student(s) can self-nominate or be nominated by a professional from their institution’s career or internship/co-op office. More than one student from a college or university may apply. An award check of $250 will be presented to the most outstanding internship/co-op undergraduate students of Technical College/University (STEM) and Non-Technical College/University (Business, Liberal Arts). For additional information and the application Click Here. Graduate Student of the Year Award: Graduate Student(s) can self-nominate or be nominated by a professional from their institution’s career or internship/co-op office. More than one graduate from a college or university may apply. An award check of $300 will be presented to the most outstanding internship/co-op graduate student of Technical College/University (STEM) and Non-Technical College/University (Business, Liberal Arts). For additional information and the application Click Here. 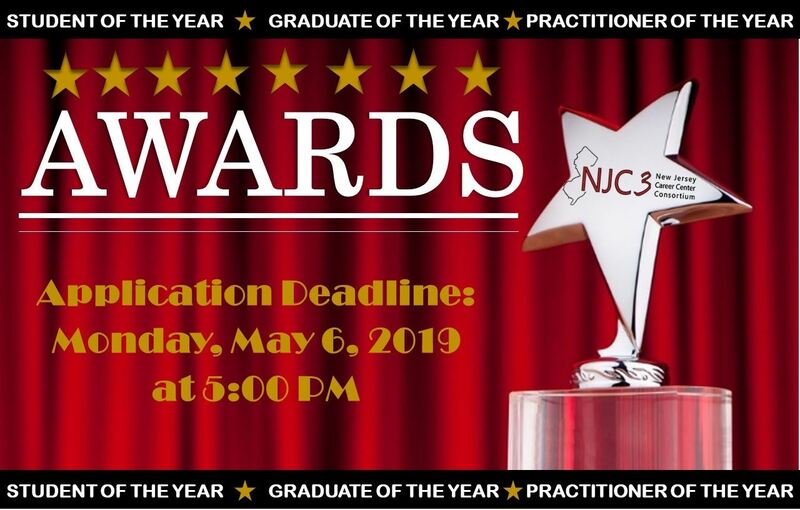 Practitioner of the Year Award: Current NJC3 membership is required to apply. An award check of $300 will be presented to a winner and a certificate. NJC3 encourages all members to apply for the award and/or to recommend colleagues to apply. For additional information and the application, Click Here.